Novus Green provides entire solution for Solar Power Production starting from design, procurement of supplies, and construction to follow-up services. The company is recognized as having secured the best-in-the-class service proving EPC Services in MW Solar Sector. Complete EPC solutions for Solar Photovoltaic Power Plants. Site Assessment and Solar Analysis. Consultancy services for setting up Solar PV Power plants. Service and Maintenance up to 25 years. Free five years of service. 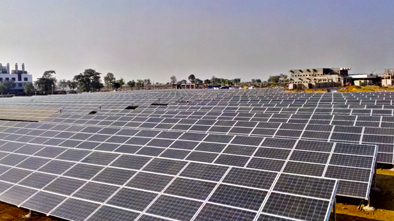 Designed, Supplied, Installed and Commissioned the 1.1 MW Ground Mounted Solar PV Power Plant for Govt of Chattisgarh in New Raipur.